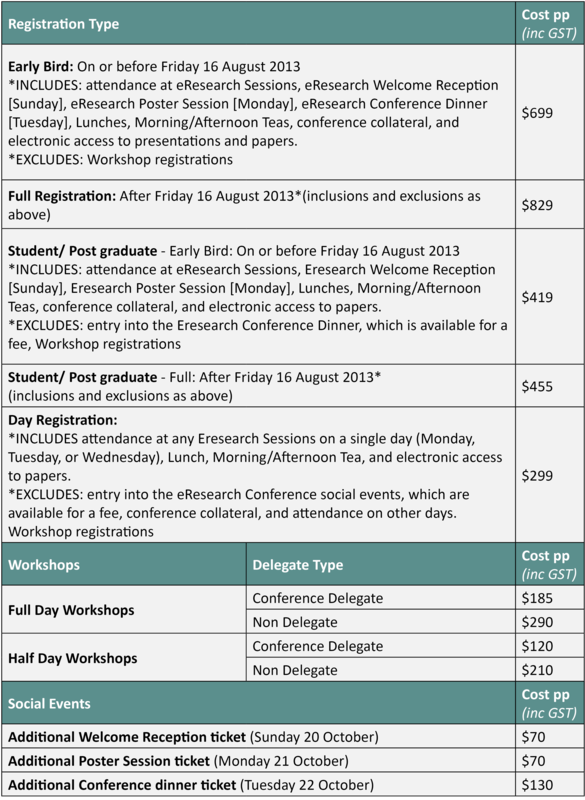 For further enquirers, please contact the conference organiser on +61 7 3368 2422 or email conference@eresearch.edu.au. An administrative fee of $150 per registrant will apply for cancellations received before 19 July 2013. Cancellations after this date, but made on or before the 16 August 2013 will forfeit 50% of total registration payable (GST included). Cancellations after this date will not be refunded; however, delegates may nominate a substitute in their place. Refunds will not be given for failure to attend, late arrival or early departures. Any refund due will be paid after the conclusion of the Conference. Please note that cancellation of accommodation must be received in writing and cancellation fees are at the hotels discretion depending on date of cancellation.